While trying to level Sally, I keep getting an uneasy feeling. A scary, creepy, uneasy kind of feeling. A hairs-on-the-back-of-your-neck-raising feeling and I finally put my finger on what it was like. I am CONSTANTLY drifting through reaver space and reaver space is not as empty as I had hoped. Middle of the day, weekdays … there be reavers. For those of you not familiar with the Firefly Series, reavers are … wait, here’s a description from someone with first-hand experience. But the thing is, sometimes they’re sated. Sometimes if you stay calm and hold your ground and don’t run … they’ll leave you alone. Every time Sally sees the opposite faction she feels like she’s passing a reaver ship in deep space. Sometimes they leave her alone … sometimes they don’t and sometimes she doesn’t even see them coming. She generally sees Horde approaching and thinks, “Oh CRAP CRAP CRAP!” Okay … be calm, act cool. Yeah … I’m bad. I’m bad, don’t even think about going there … yeah, you don’t want to mix it up with me, move along. YOU DON’T WANT ANY PART OF ME BUDDY! Oh geez … whew … they’re gone. That was close. Her other technique if she has time, is to fly straight up into the stratosphere and hope they leave. Geez, damn reavers. It certainly adds some excitement to leveling Sally but I think this is going to be a long, long, trip. And sometimes the reavers strike from behind, you don’t even have warning. I know I’m on a PvP server. I’m not complaining about being killed but really, the timing sucked. She was on the quest Colossal Guardians. To kill one of these bad boys is an enormous production of healing Void, bandaging, fearing, and it takes about five minutes at least. He came along and killed her at about 4:55. He killed her and then did the quest. Guess he couldn’t wait. That’s how those reavers roll. 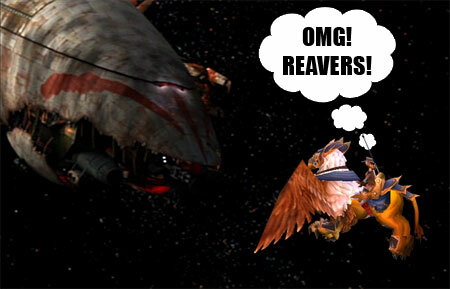 Really reavers? Shouldn’t you be in school? At work? What is up here. But it’s all good, every time she gets killed I get to enjoy flying death again. I miss that. I think she has yet to be killed by a mob since starting to 90 … just reavers. Will she make it? I truly don’t know but I’m enjoying the trip so far … well, at least until one of those reavers use her skin for a pair of underoos. Yep. Ride, Sally ride. Way, way, back in the olden days of 2011 two wizards plotted a fiendish task. 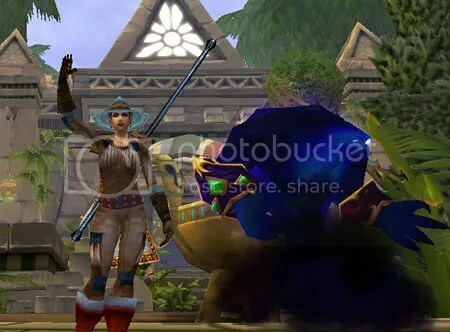 I now think of it as the Psyn-Vry Ironman to differentiate it from the later WoW Ironman which was more well known and included one thing the earlier WoW Ironman didn’t. A no-death requirement. Ironsally leveled to 85 dressed more or less in her undies and no talents … and gets to die as much as she so desires. After a little research it became apparent those Pandaren don’t go in much for selling useless common weapons and gear. For heaven’s sake they sell legitimate gear. How unfortunate. It seems her next gear upgrade would have to come from the scruffy line of poor gear which is unattainable. That was one good thing about being on Zangarmarsh, people actually listed poor and common gear on the AH. Oh well, she’ll have to tough it out. OMG! Sally, you did not just do that! You poser! You know you can’t help Nozdormu, why did you take that quest … ah … okay, I see. So she’s stuck here because her hearth’s on cooldown. Oh, wait. I’ll just enter The Caverns of Time, there’s a portal right here. 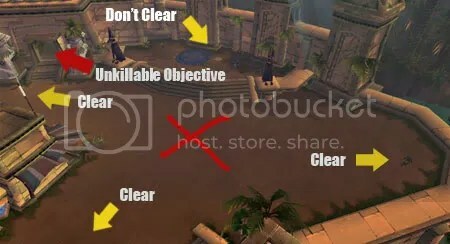 Then I’ll check in on Uldum. OMG, it was so good to finally get that over with. 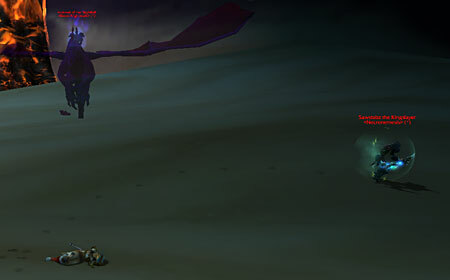 Sally takes a dirt nap at the hands of the Horde. I’ve got to wonder what he thought. There he is already for a big fight and bam. He one-shot her. Kind of wonder what was going through their mind. Damn, I am good, or what the hell is the matter with that Warlock. I’ll never know. I was afraid they might camp her poor little body but apparently they were looking for more of a challenge and soon departed so she moved on to Uldum. Crumbling Defenses had somewhat soured her on Deepholm. Completing this quest spanned hours. She had to wait for the cooldown to Summon Doomguard to have any hope at all of killing these things. Time to revisit Kavem the Callous. At 84 she couldn’t down him, let’s see if she can prevail and open up Uldum as an 85. Yay! Down he went. She’s very happy, now she’s free to spend some time in Uldum, a nice change from dreary, rocky Deepholm. Don’t know if she’ll make it to 90 but we’ll have fun trying. I do think 85 to 90 might take as long as 1 to 85 did. Sally, you should never have left Outland incomplete. It’s going to come back and bite you. Just saying. Sigh … that girl just does not listen. The WoW Ironman Challenge — Warlock Final Ding! Ironsally has made it to the lofty level of 85! Yay! Dancing in the streets! She modestly said she couldn’t have done it without her main man, or … er … tormented demon, Mak. Since I now have Fraps and WoW Model Viewer to play with, it was inevitable that I would attempt my first machinima to make a tribute to Sally. It is mercifully short, but it was fun to make. At 84 and a half and one bar Sally and I were both tearing our hair out with frustration so the ban on Healthstones was lifted. 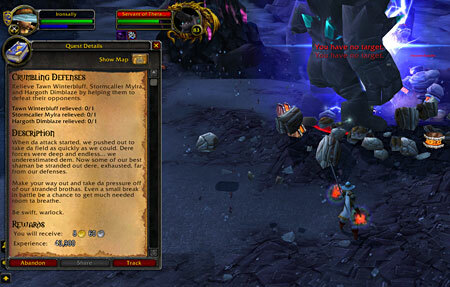 It made the difference on a few quests that were blocking her way and leveling resumed. At three bars until 85 Sally was good and truly Cataclysm roadblocked. She absolutely could not down Haethen Kaul for Fight Fire and Water and Air with … I had thought this one going to be an easy quest with having the fire, water, and air wards but noooo it was not. He casts an Earthbolt that you can’t avoid and you aren’t protected from, so Sally didn’t stand a chance. I never noticed this with any other character and after one death I watched another player down him at level 83 and the Earthbolt had almost no effect on them. Troggzor the Earthinator had proved impossible so far. He kept throwing Sally’s voidwalker about a mile away and running after him so the voidwalker was about dead before she could get into range to heal him. 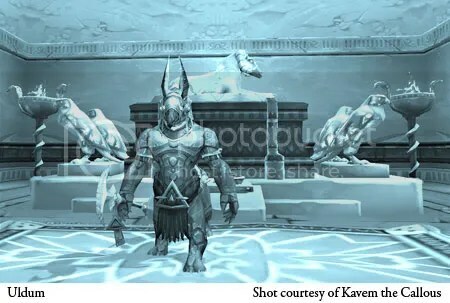 That left Kavem the Callous in Uldum. Not likely she could do it but she had to try. Nope, not even close. Since Sally liked dying in the sunny weather she stuck around Uldum and killed some crocolisks hoping they’d flip for her. With rested bonus a level 83 gave over 8,000 XP. Killing a level 83 is about 60/40 in Sally’s favor. Sally was excited to find she could take care of those Thieving Little Pluckers, never had she felt such power as when wielding that mallet. 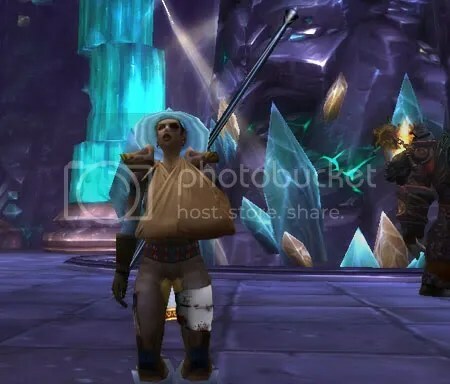 She decided to scrounge around Uldum and see if Harrison Jones might not care if Sally had downed Kavem and stolen his key. He didn’t care! He had quests for her. She could only manage Field Work and Do the World a Favor, she could not manage Just the Tip. Luckily she then remembered the quest chain with Anduin Wrynn. Sally returned to Stormwind and completed up to the part where she had to defend him from three attackers, yeah right, so not happening, she gave it her best but no luck. Nothing to do but give Troggzor the Earthinator another try. Success! Sort of, I think Mak, Troggzor, and Sally all had about 5 hp left at the end but she outlasted him and that was with the help of a Healthstone. This opened up the roadblock and she managed to continue to 85. I’ve learned a few things on this challenge. You don’t need heirlooms, you don’t need to obsessively upgrade gear every level like I have in the past. I don’t think it would be a great idea to queue for dungeons with gear 20 levels below you, but I think I’ll be fine with wearing something a few levels old. I will no longer be looking askance at players I run across that seem to be doing something strange. I will now assume they’re on their own personal challenge and wish them luck with it. 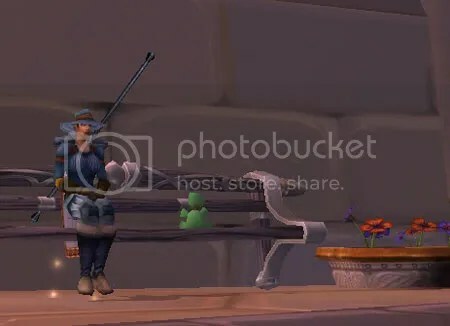 Although they really maybe did just forget to equip their weapon instead of a fishing pole, it could also be a “level with fishing pole equipped challenge”, you just never know. I am grateful to Vrykerion at The Land of Odd and Psynister of Psynister’s Notebook for thinking up this challenge. I’ve really, really, enjoyed it. Okay, Sally and I may have panicked at that 84 and a half bit, but other than that it’s been more fun that I would have expected. I last saw Sally in Uldum. I told her that it really wasn’t a safe place for her to hang around. She wouldn’t listen, she’s rather strong-willed. She wasn’t very happy at our parting, I have the feeling I’ll be seeing her again. I somehow don’t think she’s going to take up fishing and retire gracefully. I’ve even heard a rumor that she’s considering doing an endorsement for Tasty Puffballs. Me? I think my main has some plans for me. She wants me to help get her guild to level 3, woohoo! I might do some rare spawn hunting. After that, who knows. Anyone got a good challenge in mind? 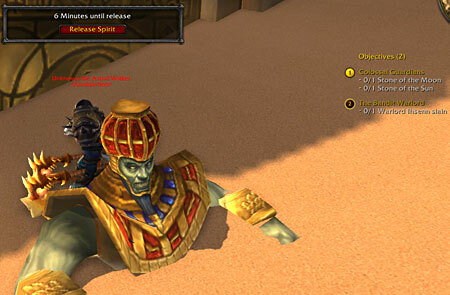 Want to try the WoW Ironman Challenge for yourself? The Ironman rules are at Psynister’s Notebook. Ironsally unfortunately had to move on to Deepholm. I feel foolish now. Looking back on Ironman posts I made where I said it was hard. Psshaw. Playing Sally may have been hard compared to playing normally but it certainly wasn’t agonizingly painful to play. It’s now so painful I make up excuses to avoid it. Oh, ah Sally, I … ah … have to go pick up all the dog poop in the backyard, later. I’m not a complete nut, had this challenge been so unenjoyable at practically ANY OTHER level than 84 and a half and one bar I would have ditched poor Sally, Ironmary can attest to that. In Hyjal, Sally and I were feeling pretty confident. She completed all of Mount Hyjal. I was surprised, I didn’t think she’d be able to do the last three but on Magma Monarch and Death to the Broodmother the voidwalker didn’t need healing so she could Life Tap to her heart’s content and The Firelord just took a few attempts but she finally completed it. Sally went back to Vashj’ir to continue from Nespirah. Not many problems other than her handler doing thinks like getting her lost and having Sally pop up in places like Tenebrous Cavern. O hai guise!!! They weren’t amused. At this point if I had to try to describe it, playing seemed sort of like playing with Resurrection Sickness but certainly doable. She finished everything up until the 130th quest, … It Will Come. She died twice and was tired of being underwater. She decided to read up on it and come back later, but now on to Deepholm. She was tasked with Gunship Down and there was a quest to kill five of the elementals in the area, I can’t remember the name. 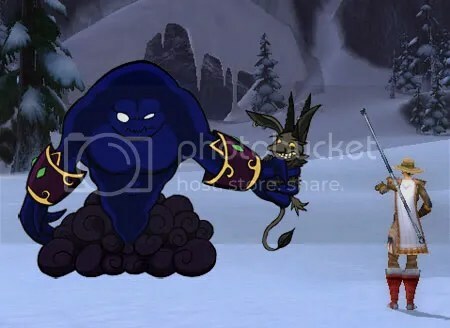 Killing five elementals took approximately a half an hour and seven deaths. Sally wasn’t happy, if she had to die she wanted to do it out in the sun, I think Sally may suffer from SAD. I tried to tell her Uldum would be even harder but Sally refused to listen and off we went. We took the caravan ride and then pretty much immediately hit our cata roadblock. Kavem the Callous, we need that key. Summon Doomguard didn’t help, Summon Infernal, no help. Kavem’s health isn’t budging and Sally has to heal so much that the voidwalker can’t keep aggro. I convinced Sally to go back to Deepholm and die in the dark but she’s coming back to get Kavem with a plan. Now might also be the time to stock up on some mana pots and fire up the Healthstones. She’s going to try to kite him out of his building after clearing the area but I’m afraid since killing three 83s will take so long, they’ll respawn while she’s out there. Oh the plus side, while not being competitive in the least, her handler is EXTREMELY STUBBORN. This has been pointed out to me many, many, times. In this case though I see it as a good thing. 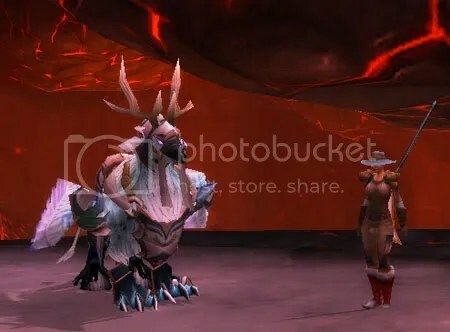 While Sally could certainly get to 85 by doing dailies in Northrend for six months, I want her to get there questing where she’s supposed to quest no matter how bad it gets. I’m not above sending Sally to ride some rams to pad her XP but that’s about it. So is there a moral to this story of demoralization? Yup, if you want to try the WoW Ironman Challenge learn from my mistakes. 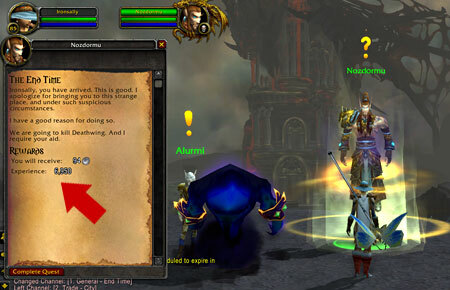 Do not leave Azeroth before you’ve exhausted ALL the green quests. 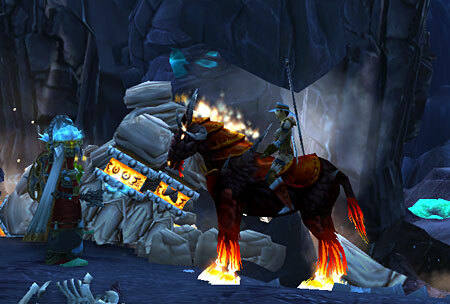 Do not grow bored and leave Outland before you’ve finished ALL the green quests, really. If I had done that Sally wouldn’t be in the pickle she is now. It’s all my fault … I admit it … geez Sally, give it a rest, I said it was my fault, they know. It may be a while before we hear from Sally, she’s going to be busy padding her death count. Okay, maybe I spent too much time in Vashj’ir but doesn’t this dog look like part of the scenery there? This seems to be the latest thing in China. 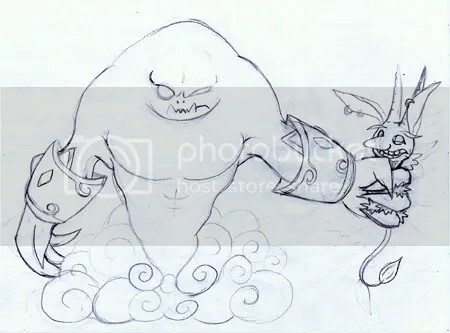 I think this is a Chinese Wow player’s tribute to Vashj’ir, but I must say I think that dog looks embarrassed about the whole thing. My dog would never allow that, only the horde emblem works for him. Ironsally finally reached level 84 but it wasn’t pretty. It has been the most painful level so far. Sethria’s pictured above as Sethria’s Demise is the quest where the feared linear leveling road block reared its head, but I’m getting ahead of myself. Sally only managed to get to 83 and 8 bars in Icecrown. And even that was only done by abusing the many dailies and it was sucking the joy out of life. I had PROMISED myself I would never, ever, have to joust again but Sally wanted a title and it was XP, so joust we did. After leaving Icecrown she decided to do a few Brewfest quests before heading to Vashj’ir. Really just stalling. Sally was ready to go, but not me. One of my many, shall we say “quirks” to be kind, is that I’m somewhat claustrophobic. I never really knew until I had to have an MRI. If you haven’t ever had one, I can only describe it as being buried alive in a storm drain while men with jack hammers try to hammer their way in to free you. All while you must remain perfectly still … and don’t breath. Yeah, that’s when I found out I was claustrophobic. I’m not going into the scene I made. Just imagine a lot of colorful language and thrashing around. So the problem is Vashj’ir has kind of the same effect on me. I find I keep taking deep breaths irl. I can’t breath, help! As a warlock Sally even has underwater breathing, what’s wrong with me, we’re fine, geez. Get a grip you nut. I will not even log out a character there. I always go back to Stormwind to log out. I can’t leave them there, trapped under all the weight of all that water. Things were going well, or as well as they can Ironman fashion, when we got to Fathom-Lord Zin’jatar, the first sign of trouble. Sally didn’t have enough mana or power to kill him, just couldn’t do it. She had been using Demon Armor for the increased survivability for Mak her voidwalker but it meant practically no spell power at all. She changed to Fel Armor, Mak’s health goes a lot faster but she has more spell power with Fel Armor. Using Fel Armor and a Doomguard she finally took him down. Needing to get a breath of fresh air she went back to Mount Hyjal. Things went pretty well up until Sethria’s Demise. The quest requires you to take Sethria down to about 75% health to get her to change to dragon form. At that point you can call in reinforcements and all’s good after that. Sally could only barely scratch her health, I mean I think it was going down a little but not so you would notice before she ran out of mana. She finally Health Funneled herself to death from frustration. Sally was stuck. She had about a half bar to go to 84 so she dejectedly decided to just grind the half bar to 84 and try again. At level 84 with a Doomguard, she finally completed the quest but it was close. I might have to lift the ban on Healthstones and Mana Potions if this keeps happening. What’s next? Yup, aerial jousting. And you know what, I’m thrilled. Even if it is a form of jousting I am so happy to get to do something that doesn’t rely on Sally’s power, or lack thereof. Sally has the rest of Mount Hyjal and about half of Vashj’ir to complete. I don’t know what the next road block will be but I’m so hoping NOT to have to take her to Deepholm. Here’s hoping you’ll hear from her next time from the lofty level of 85. 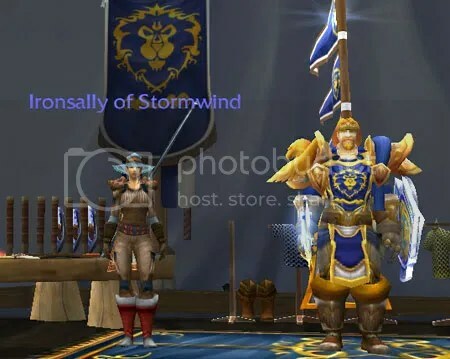 Ironsally is back in Dalaran. She had gone to Mount Hyjal on hitting 82 for just a visit and ended up staying a while. 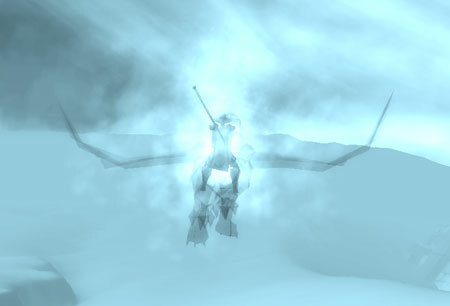 She was somewhat disgruntled by being stuck in Storm Peaks on Fervor of the Frostborn. Not a hard quest for any normal character but she was getting smooshed repeatedly. This meant she couldn’t continue with the chain and see the The Brothers Bronzebeard reunited which she really wanted to do. She did the bidding of the Sons of Hodir, except for Thrusting Hodir’s Spear, he’ll have to take care of that himself. She didn’t think the possible XP would be worth the certain death. She hasn’t been looting kills as she really doesn’t need any money, bad idea. She got stuck doing the Sons of Hodir quests so I looked it up and the quest item she was missing dropped from elites she had just killed with the help of a boulder. She had turned in the quest so had to go back and kill the elite without help. Luckily they weren’t very elite, so she managed. She did a few quests in Icecrown, one of the first ones was like playing whack-a-mole. You’d save a soldier from being entombed in a cocoon and he’d buff you with Blessing of Kings I think it was and she’d be trying to kill spiders while hysterically trying to click off the buff so the Ironman Police wouldn’t see it. Staying in Wrath is really, really, slow. Not because the quests are green but because of the rotten XP you get from kills. I had heard people say the quickest way to level was grinding, but never really thought about how much just your kills help you level. It’s depressing to kill things WITH rested bonus and get about 150XP, essentially nothing. In Cata she was getting over 3,800 XP a kill so it seduced her away from Wrath for a while. Cata is HARD. Although it was not all terror and death, she took time out to have some fun and get an achievement! 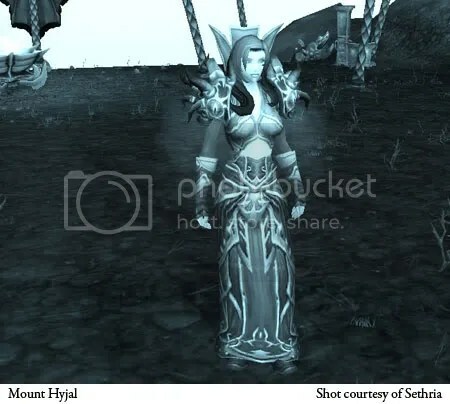 Sally stayed in Mount Hyjal and quested and enjoyed that enormous XP per kill up until she was sent to Sethria’s Roost. These guys were level 81. She tried one and it was back to being a boss fight. It’s just as well something made her come to her senses and return to Wrath. Because of the linear questing in Cata if she gets stuck on one there it will be all over, so she really needs to go back and take advantage of every quest left that’s green or higher to get at least another level. Bye guys, I’ll be back. Yeah, I’m so sure they’re shaking in their boots to hear that. So Sally headed back to Storm Peaks for one last try at Fervor of the Frostborn now that she was level 82. On flying over Brunnhildar Village she remembered the daily. Might as well do it for XP. What’s up with that! 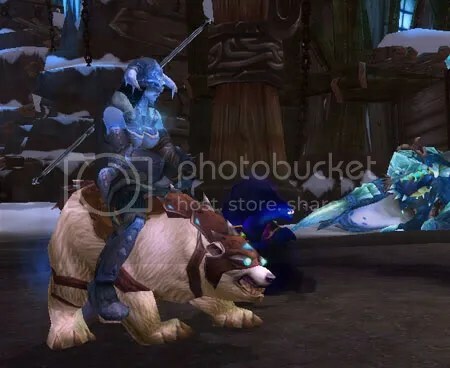 Have they changed these dailies to give you the mount on your first daily or is Sally that lucky. My other characters were not amused considering how many times they had to do dailies to get that bear. I was also surprised that she managed to complete one of my favorite quests, The Drakkensryd. I’m pretty sure there’s some mechanic there that won’t allow you to die because she really can’t kill much of anything without her voidwalker, but she did. She finally managed to complete Fervor of the Frostborn at level 82. She used Soul Link which she never uses normally as the voidwalker’s health is more important than Sally’s. She also set the voidwalker on him there toward the end to distract him. Ironsally finally got to see the Bronzebeards reunited. So now Sally’s back in Dalaran, she got a shoe shine, did some shopping and is about to set off for Icecrown. Or she could finish up some green quests in Zul’Drak. I’m not sure she’ll finish them. Stefan Vadu really gives her the creeps, I don’t know what it is about that guy, but something’s not right there, shudder. Not really. Ironsally didn’t commission it, I did it for her. At level 80 she was feeling a bit down and I thought it would cheer her up. Meet Makdok, the reason Ironsally’s made it this far. Her beloved bodyguard. Okay, he’s just horsing around, just some hijinks … MAK! Send him back NOW! “Send him back NOW” is the title of this incredible portrait of Mak. I feel an addition to my business wardrobe coming. It all started when I was doing my morning check to see if any of my favorite blogs had a new post. I found a new comment on one, with a link to deviantART. I’m nosy and it was ART! I must follow. 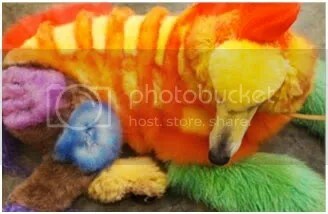 I found this post by Furrama. I looked at her gallery at deviantART and went to her J. Christine Leach website. I thought holy moly, I’ve got to contact this woman before she changes her mind! She graciously agreed to accept the commission to portray Sally’s blobby Voidwalker. The only input I gave her was he’s really mean and buff. Before you know it I received her sketch. It was perfect! Just how I imagined him. Sally was going to be so happy. I told Christy he was perfect so she said she would commence with the inkaning, one of those fancy highly technical terms artists use I guess. I then bounced up and and down on my computer chair in anticipation. Luckily for my chair, turnaround was amazingly fast and within days I received Sally’s beautiful Mak in all his glory. I received a smaller web-sized version and a large version suitable for print. Ironsally was so pleased she’s managed to drag herself to within three bars of 82. 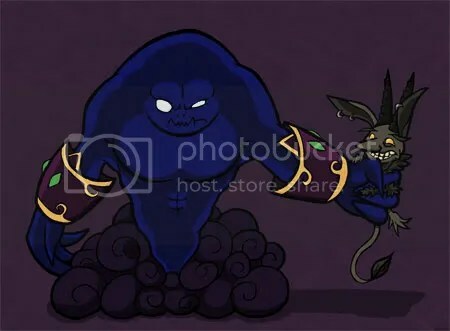 So if you have a character you’d like to immortalize for all time, check out Furrama’s gallery, it’s really worth seeing. Ironsally loved it Christy, thank you!